Designer Collection of Indian Wedding Sarees & Lehengas. Lehenga has been the only preferred outfit for the brides to wear on the wedding day. Lehengas are not only the outfit for brides but also the brides sister , mother & friends all of them like to wear lehengas. The popularity of lehengas is in creasy every day not only in India but the whole world, because of its grace & Royal look. Indian Lehengas come in a vast variety & price range, to suit the needs of every bride & then family. Indian Wedding Lehengas are long skirts with heavily embroidered with Zardogi, Ari Thread & Stone Work. They come with a blouse matching or contrast and a duppata or a chunni. 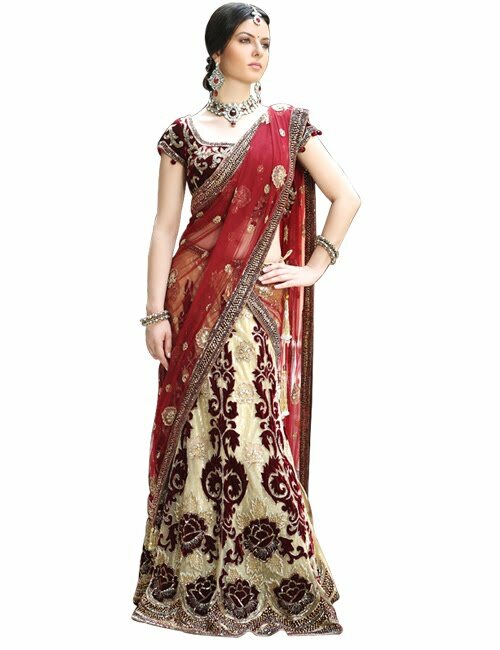 Bridal Lehengas are available in almost all colors but most popular are the bright colors like Red , Mehroon, Orange & Pink. Now a days Designer Lehengas designed according to the theme of the wedding are also very popular. The most commonly used fabrics for lehengas are Brocades, Silks, Valvets, Georgette and Net. However a combination of 2 or more fabrics is also available. Bridal Lehengas are designs using two basic pattern one is the Bias cut & another is the A line(or The Kalidar Lehenga). All the lehengas are made using these two patterns or their combination or variations. Duppatas are usually chiffon, georgette, net. Trendy latest collection of lehengas is available online at www.ranas.in now a days lehenga sarees are also be coming popular, these are usually made by attaching the duppata to the lehenga making it more convenient to wear. Thanks For sharing information about lehegna ! lehenga choli is also known as ghagra choli. 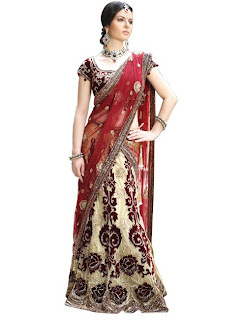 For wedding most of the girls prefer designer lehenga choli. Your attire is perfect for wedding, your jewellery is giving a unique style to you. A bride can select the one out of four bridal lehenga patterns. The last and most graceful flared lehenga is having numerous pleats and presents the bride with royal look.